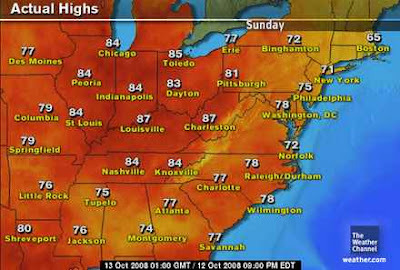 More Than Just Corn: Is It Fall or Summer? 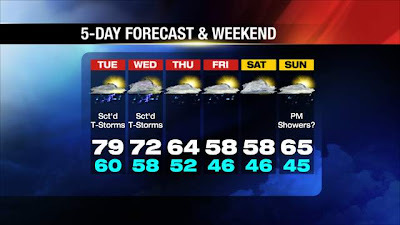 I am confident by the end of this week we will be out of shorts - FINALLY! Just in time to visit the pumpkin patch with my family, without bees! 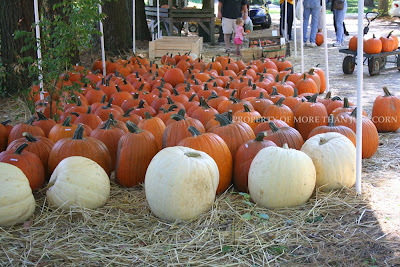 This weekend, we visited a local stop in our town to get our carving pumpkins. We have an annual night that my parents and brother come over for a chili supper, and we carve pumpkins for display on Halloween night. It's usually a couple days before the holiday, but we like to get the pumpkins early to decorate the porch etc. 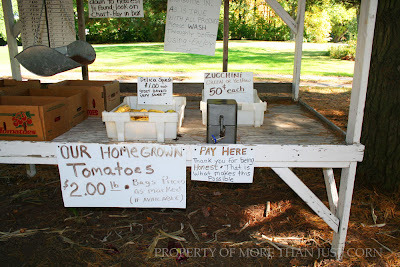 The place that we go to buy them is actually someones home in which they set up a stand in their driveway with veggies and pumpkins that they've grown on their farm. It is by far the most inexpensive place we've been able to find pumpkins each year - it proves how much mark-up these little Country Markets put on theirs. This coming weekend, we will make our annual trip to the very popular Stonycreek Farm with my in laws so that the kids can walk through the pumpkin patch and choose one themselves. We love that day with the grandparents, and have been doing it since Carter was a baby. Here's some photos from the weekend activities! 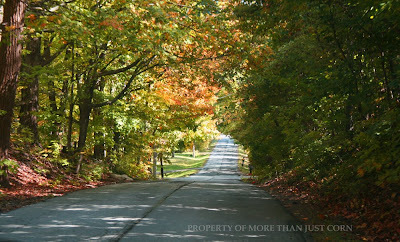 This is a shot of the road in town that we take to get our pumpkins. It looked so pretty with the leaves and sunlight that I had to snap one! Here's a little area where the pumpkins are in the driveway of this home. Pumpkins start at $2.00 for a decent carving sized one! They have some really interesting varieties of pumpkins as well. You can see Olivia in her hot pink shorts at the top. The color hot pink, shorts and short sleeve shirts just don't scream "It's Fall" to me.... The pumpkins sure did though! 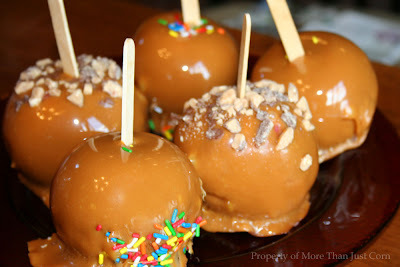 So, my kids don't like caramel apples, but 'tis the season, so I had to make some anyway! Can't forget to show The Boy's second year in Scouting. He's a Wolf this year... here he is proudly showing off his new colors. 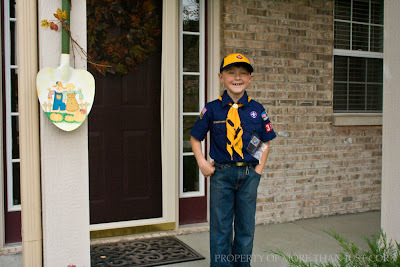 Boy Scout Popcorn sales have begun, so we've been pounding the pavement this weekend filling up his order form. Our community set the bar pretty high - Zionsville was #1 in the nation last year for Popcorn Sales. Our little town!! It's 42 here now! Brrrrrrrrrrrrrrrr... we're supposed to warm up a bit as the week goes along. That, I am looking forward to. We seemed to skip cool weather completely. Went from warm to, "OMG! It's cold!" I'm envying that forecast--the part at the end of the week that is! Love the pumpkins...Amin is doing scouting this year for the first time. So far he is really enjoying it. Looks beautiful. How are the popcorn sales going? Shannon - Brrr is right! My SIL said there was a chance of snow flurries already. Dang! TY about the new Feed too! Mindi - there is another scout who's supposed to do your street. I'll contact them and see if they are done. If so, I'll send Carter your way! Wait until the second week in January and you will wishing for these 70-80 degree days. Andrea, looks like a fun weekend, we are hoping to do it when we get back the following weekend - we usually go this Friday each year because the kids don't have school but we will be gone!!! Hope we have a nice day! I love the pictures of you and the grandparents choosing your pumpkins each year. Yes, I look forward to it each year. Here we usually buy ours at the grocery store! Yum! 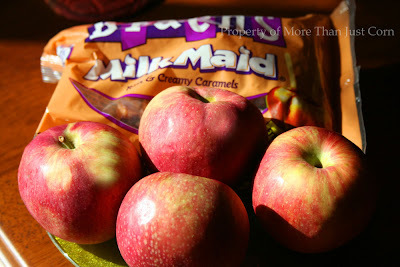 How can someone not like caramel apples! Very cute pics.